We were all so sorry to hear about Shirlene's bout with cancer, but with today's amazing medical advancements chances are very good for a complete recovery. "Jim was a big part of all my stories. 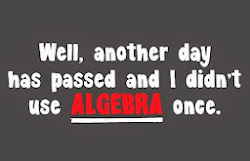 Just to be funny - fate is testing me. My first show in July was on my birthday - and the fifth show is Sunday July 28 - 3 days before Jim's burial at Arlington - full military honors. 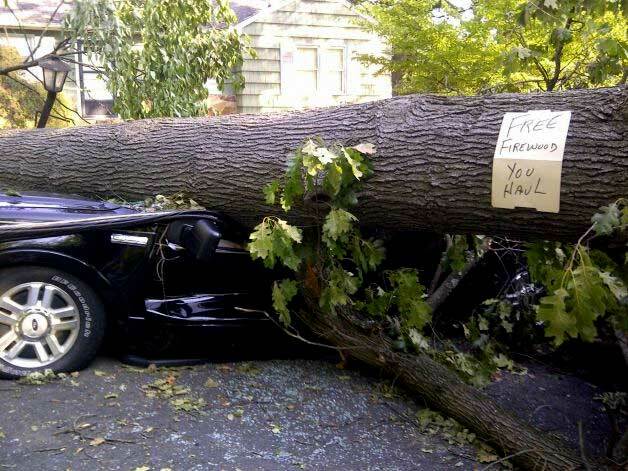 Would you say that's running the gauntlet. By the 18th I should be back on my feet." August 18 is the day when she will by my guest on the show that I host on Virginia Cable TV, called OUT OF THE PAST. Don't be surprised if we talk a lot about Charlotte Central High School on that show. After we finish editing the show, I'll put a link up here on the website. Ellouise was thrilled to have Lydia Peele introduce herself after one of the shows last week. The amazing Lydia is the grandaughter of Warren and Becky Sparrow, and happens to working in Washington for the TEACH FOR AMERICA PROGRAM. Lydia was President of the Student Body at Kansas State University! That should give you an idea of what kind of dynamo she is. The press reviews of Ellouise's show were great. 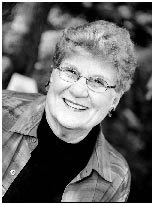 "I just returned from seeing "Pushing Boundaries," featuring storyteller Ellouise Schoettler. She was wonderful! After giving us some background about her exodus to Baltimore to be a nurse, meeting her husband and having children, she talked about the experiences that molded her in college, and how she became Campaign Director for the ERA, among other things. 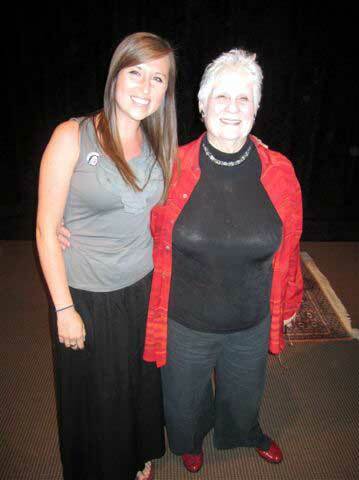 I really enjoyed hearing her stories and what she learned from the different people she met. She referenced being from North Carolina many times. After the presentation, I told her that I was Warren Sparrow's grandaughter and that I had also met his friend Jennie Margaret, the famous senator. She and her friends seemed delighted. Ellouise assured me - and I agreed - that you had many "NC politics" stories to share. I think I will e-mail her to tell her again how much I appreciated her story. ....Two weeks ago the vegetable stand I go to every summer got in a load of ripe tomatoes from North Carolina. The were the best that I've tasted in at least three years. Yesterday they had tomatoes from Maryland and they were very good also. 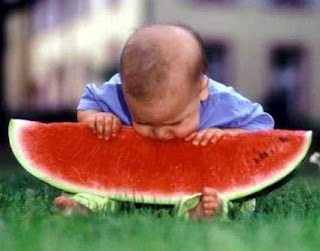 Don't know what the problem has been in previous years, but am happy to know that my favorite fruit is back! Yes, the tomato is a fruit. But, as someone once said, Knowledge" is knowing the tomato is a fruit, Wisdom is knowing not to put it in your fruit salad." I remember it just like it was yesterday. Another rock with a mysterious note attached had been thrown through the front window of the home at 23 Elm Street in Bayport located on Barmet Bay. My youngest son. David, started snickering first, then unable to keep a straight face any longer, I put the book down and joined in laughing at the much overused technique of beginning a new mystery that teenage detectives Frank and Joe would solve about 50 pages later. 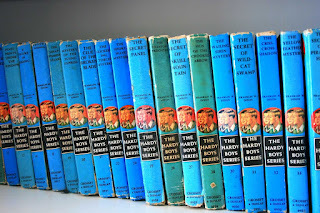 My laughter was bitter sweet, though, as I realized one of my favorite activities, reading Hardy Boy Mysteries to my sons had just come to an end. My youngest had just outgrown me. I tried to convince myself that perhaps it was for the best, because this was the early 80’s and parents were being inundated with “experts” spreading guilt in the form of buzzwords like, “Quality Time with your kids,” “Bonding” and stuff like that. Anyway, perhaps I was a little lax in some of the serious things a Dad is supposed to teach his kids. I decided then and there to do some research and see if I could change my slothful ways in the Daddy Department.. Until then, I would just keep on winging it and discuss more serious things as I thought of them. One of the first things that came to my mind was a shortcoming that I personally had. 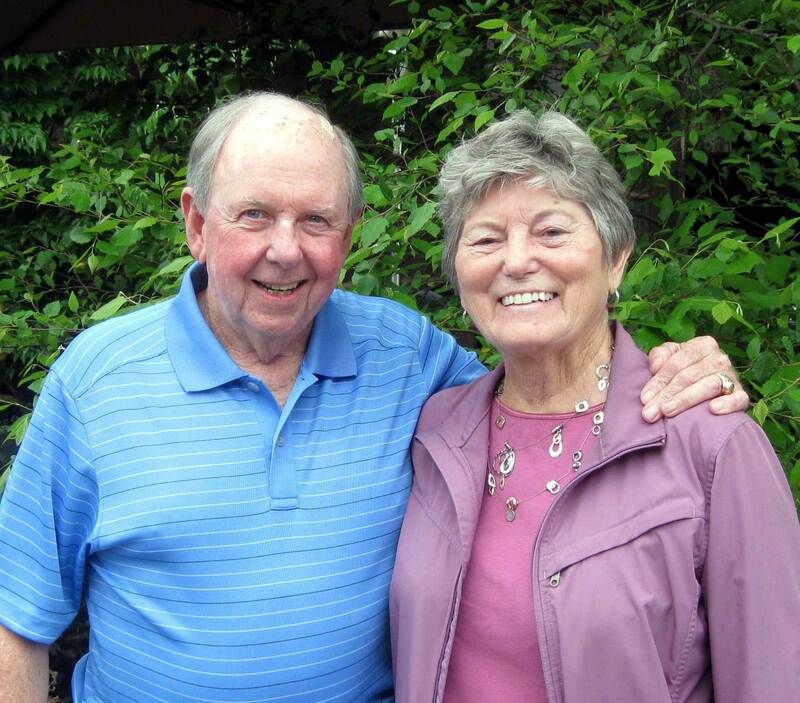 On more that a few occasions I had been totally unaware of the background and history of the people I ostensibly knew quite well…until their obituaries appeared in the newspaper. One of my bosses at the TV station was a highly decorated fighter pilot in WW2 and the man who was the head of the “Art Departmant”was a British fellow who had been a spy behind enemy lines during the war. I was totally unaware of either of their backgrounds. 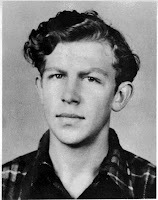 I tried bringing up the subject of concentrating more on your friends and people around you and less on yourself…etc, but David was more interested at the time in watching Laurel and Hardy movies with me and attending the first meeting of the Washington chapter of the Laurel and Hardy Club. We had both become rabid fans of the old L and H movies and had jumped at the chance to be charter members of the first fan club of its kind being formed in Washington. We joined about 20 others at the Arlington Library for our first meeting, presided over by a man named Walter Boyne, whose idea it was of starting our chapter. Boyne told us the history of the Clubs (see below) and asked us to be thinking about a “Name” for ours which would be voted on at the next meeting. 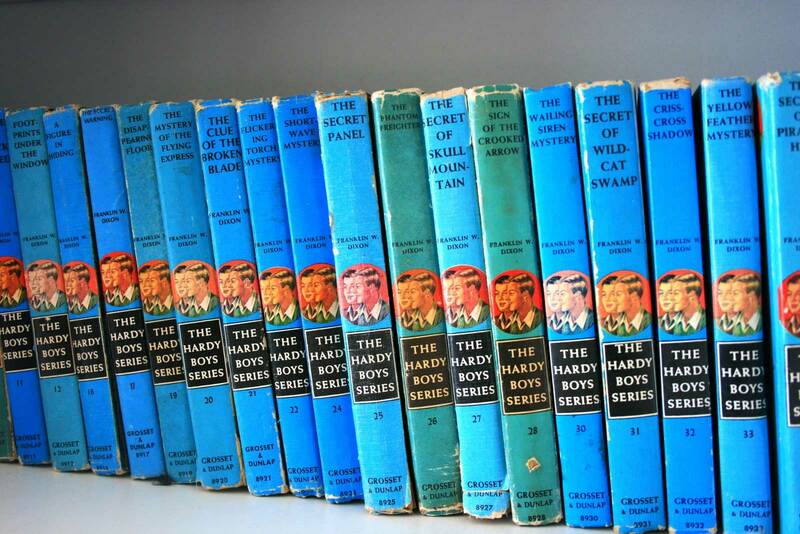 As I recall, we named our “Tent” “Saps at Sea.” All chapters were named after one of the L and H movies. After about six months, Walter called the house and told me that the library had a scheduling conflict so he changed the location of our next meeting to a building in Suitland, Md and he gave me the address and directions and mentioned something about a “Silver Hill” building. 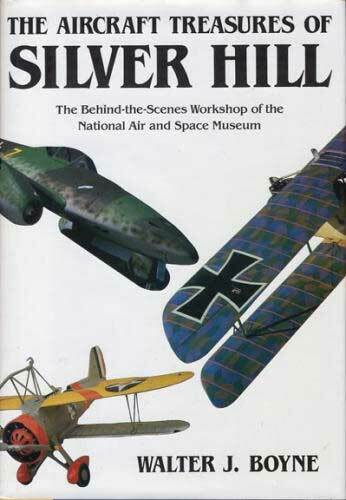 It turned out that Silver Hill is where the Smithsonian Institution's National Air and Space Museum restores aircraft, spacecraft, and other artifacts. 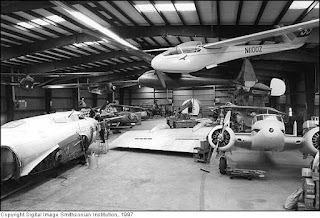 It was created in the early 1950s to store, protect the museum's growing collection of World War II aircraft and provide space to restore them. It was an adventure to remember! We had the facility to ourselves, 15 or so of us talked about Laurel and Hardy for about 10 minutes and then spent the rest of the evening wandering aimlessly among priceless artifacts of history. Until that night I had no idea that in real life, the founder of our club was the head of the Smithsonian’s Air and Space Museum. I was also totally unaware that Walter Boyne was in the Aviation Hall of Fame having flown 120 hours in Vietnam and had written 50 books and over 1,000 magazine articles. On our way home that night David and I stopped at an old fashioned Diner on Route 29 for a late night snack. I took the opportunity of my bad example of not knowing anything about Walter Boyne to be a good jumping off point for my fatherly lecture about the importance of learning about others…instead of concentrating on just yourself. I was on a roll, sounding as fatherly as I could muster, “Take for example our waitress,” I intoned, “I’ll bet she’s worked behind this counter for years and who knows what stories she could tell about all the people she’s met in this Diner. “There are 8 million stories in..."
"This diner has been here for years," I continued, 'in all that time, I’ll bet she even waited on some famous people. As the lady placed our check on the counter, I commended her on the excellent service and gently asked a few questions. Sure enough she had been at that same job for almost 15 years. I glanced knowingly at my son and smiled. "Yes, as a matter of fact, there was one famous person who came in one night. I waited on him at that table over there…” pointing to the table right behind us. “And who was it?” I asked. “It was Buck Owens’ bus driver.” She replied. Then I heard that sound again. It was the same snickering sound that I heard the night that rock went through the window of 23 Elm St in Bayport. 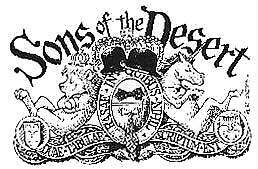 The Sons of the Desert is an international fraternal organization devoted to lives and films of comedians Stan Laurel and Oliver Hardy. 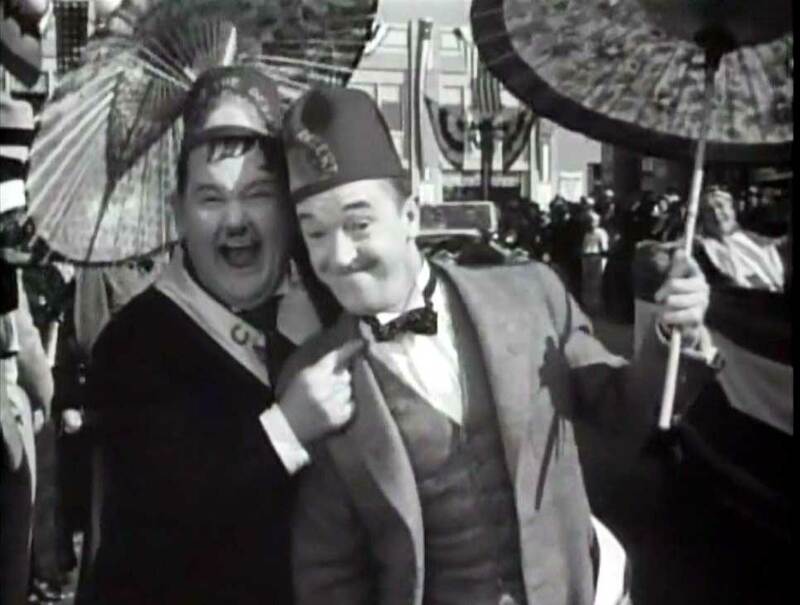 The group takes its name from a lodge that Laurel and Hardy belonged to in the 1933 movie Sons of the Desert. In 1964, a few years after the book biography "Mr. Laurel and Mr. Hardy" was published, author John McCabe formed a small group of Laurel and Hardy admirers including Orson Bean, cartoonist Al Kilgore, Chuck McCann, and John Municino. McCabe created a mock-serious “constitution” that satirized the formalities of many social organizations. Stan Laurel endorsed and humorously revised the document; he suggested that members might wear a fez or blazer patch with the motto "Two Minds Without a Single Thought." Founding member Kilgore created a logo with the motto in Latin (in the spirit of Laurel’s dictum that the organization should have “a half-assed dignity” about it) as Duae tabulae rasae in quibus nihil scriptum est (literally: "Two blank slates on which nothing has been written"). 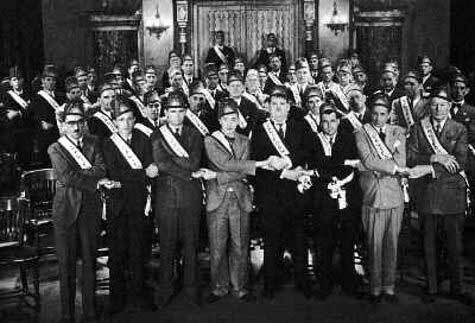 The first public Sons of the Desert meeting was held in New York City in 1965, shortly after Stan Laurel's death. McCabe's group quickly spread to other American cities, and then to other countries. 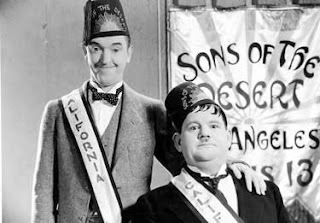 In keeping with the tongue-in-cheek “desert” theme, each local chapter of the society is called a “tent,” and each is named after a Laurel and Hardy film. There are over 100 active tents worldwide, and members meet regularly to enjoy Laurel and Hardy movies in an informal atmosphere. Many chapters formed in the 1960s are still active today. In addition to local and regional meetings, Sons of the Desert holds international conventions, every two years since 1978. Most have been located in the United States but some have been held in other countries. Actors and technicians who worked with Laurel and Hardy are frequent guests, and rare films and memorabilia are exhibited. Visitor from the "Beehive State"
What's that old quotation that goes something like..."When Muhammad can't go to the mountain, then the Mountain comes to Muhammad.....whatever." I thought about that when I learned that Maxyne Motte Yawarsky had traveled all the way from Utah (the Beehive State) to visit her sisters and, of course, join us for one of our LDLs, if possible. Unfortunately, her sisters live in Blowing Rock, NC. which, is quite a ways from Jimmie's of Mint Hill. 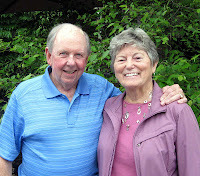 However, compared to Utah, it's very close to Obie Oakley's summer home in the Highlands Ever vigilant in his duties as our roving CHS54 good will ambassador, Oakley, treated Maxyne to some real southern LDL hospitality at one of Blowing Rock's finest restaurants. At the next Bored of Directors Meeting, I'm going to apply for the job of "CHS roving good will ambassador"
Remember how long and unending some of those hot July days once seemed? I think the fact that we didn't have air conditioning back in those days had a lot to do with it. We here in Virginia were reminded last week of how uncomfortable July can be without the miracle of technology. I have no tolerance for the "environmental wackos" who want to take us back to the early 1900's. Perhaps, hopefully, someday they will understand how misguided they are. Fortunately, there won't be any of those folks at Tuesdays gala LDL July event at Jimmies of Mint Hill. There will only be a bunch of brilliant and friendly chronologically gifted CHS '54 Wildcats bonding together while breaking bread. the food listed there is all locally raised organically and completely unprocessed and delivered to Jimmies by mule cart. We hope you'll be with us. Spread the word! Invite other classmates to come! Even better, bring someone with you! Be sure YOU, come! I feel badly about not getting Warren Sparrow's Betsy Ross flag picture on the website til rather late in the afternoon yesterday. The 4th of July was almost over before I got it posted. However, we've had our problems up here as you know. Lots of power still out. I really feel sorry for those folks. Two days of 100 degree temperatures and no air conditioning just about did me in. 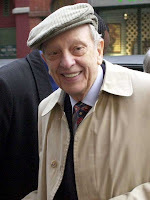 Being in the radio and TV business I also got to meet and interview Don Knotts, my other "hero" from Mayberry. Both Andy and Don were as nice and "down home" as anybody you'd ever want to meet. My friend Bob Raiford, whose hobby was playing "extras" in Hollywood and TV movies, many of which were being filmed in North Carolina for a number of years, told me about meeting Andy in the dressing room off the set of a "Matlock" episode. 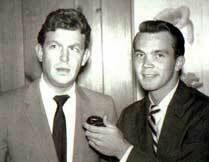 He said that he mentioned that he had a record show on WBT at the time "What it was, was Football" came out. Raiford told Andy that when Orville Campbell (the Chapel Hill record promoter for Andy's record) brought it to him at the station, he listened to it and laughed like crazy! However, Bob explained that since his show only featured what he considered good standard popular songs, he refused to play the record. This is the "Betsy Ross Flag" that Warren and Becky Sparrow Fly over their house every 4th of July. This particular flag was the third one Betsy made for George Washington's approval. The first one she made had the stripes going vertically. The second one featured stars with six points. This flag was her final version. She told George that making flags was a lot of damn work, so if he didn't like this one, then he would have to make the next one himself. Hence the expression, "Let George Do it." Now, this bit of nonsense was written by your loveable, handsome and modest webmaster, whose brain was obviously seriously damaged by the early "fireworks" we had up here in the Washington area on Friday. 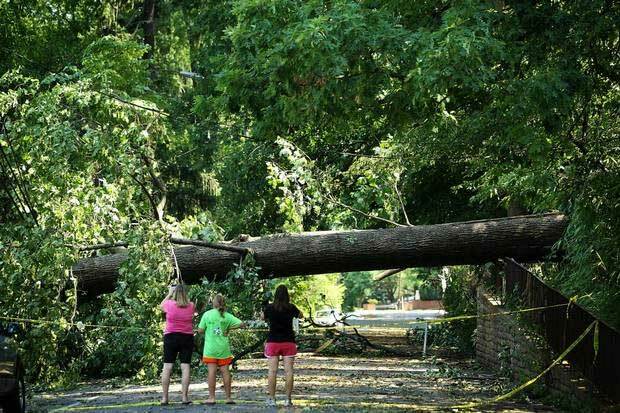 It was officially called a Super Derecho "A Land Hurricane" and slammed into this area Friday evening with 80 mph winds that leveled trees and telephone poles and roofs and just about everything else in its path. Power is still out in many places around here but ours was out for only 2 days. We were very lucky! I don't believe I could have survived one more day of 100 degree temperatures without air conditioning! Now, here is Warren Sparrow with the "Rest of the Story..."
"The flag was a gift from Ambrose J. Hinnegan who died about two years ago. 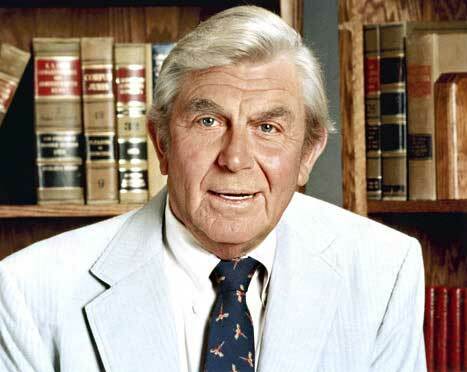 "Andy" was a Philadelphia lawyer, having moved to Winston-Salem late in his career. His wife Ellen (also deceased) was an antique collector. I have no idea how they acquired the flag. All I know is Andy delivered the flag to me in 1986, the year I was running for Forsyth County District Attorney. Andy was a big help in that first campaign, planting yard signs throughout the city. We have been flying it in front of the house during national holidays for 26 years. We have never had it cleaned. Sorry the story is not more exciting. 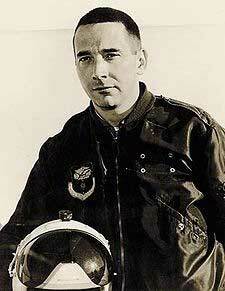 For all I know it flew on the the sloop Wasp, one of the first ships of the Continental Navy. Happy 4th of July!